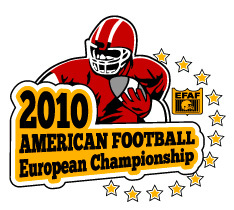 The European Championships will be placed in Frankfurt, Germany from 24th until 31th of July 2010. The Official Homepage for the tournament is available at www.football-em.de. EFAF will have a live ticker from each game. The final Germany vs France will be broadcasted live on Eurosport2. Eurosport2 is available in the internet at http://videos.eurosport.com/eurosport-player. 2010-07-31 EC2010 Final: Germany is the new European champion!